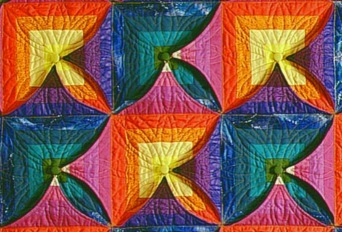 Kameleon Quilt no 1 "Night and Day"
possible combinations, out of which 512 will form symmetrical patterns. Below you can see a few of the possible variations. To see how the quilt can gradually change how it looks, see the animated version here. 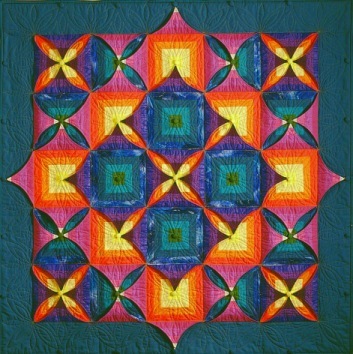 In this picture the triangles are buttoned so that they form a medallion-style pattern. We can see triangles with both pink and purple sides. This picture shows the triangles buttoned either upwards or to the left, forming a diagonal pattern. We can see both pink and purple sides of the triangles. 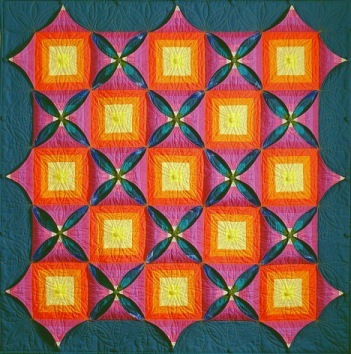 Detail showing the curved 3D triangles and buttons. 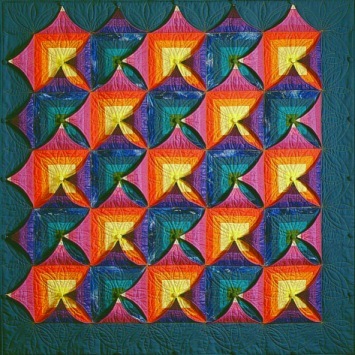 "Night and Day" was finished in the autumn of 1998, approximately a year and a half after I got the initial idea. 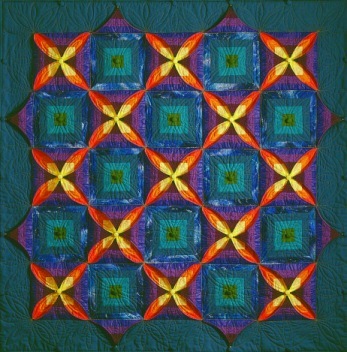 In the autumn of 1999 it was juried into the "Pacific International Quilt Festival" in California, and here it got an "Honorable Mention"
"Night and Day" has also been exhibited at different venues in Norway and Scandinavia. In the autumn of 1999 I wrote a pattern for "Night and Day", which is still available both in the English and Norwegian version. .